Friday night brought some of the best boys competition in the state to Mansfield Stadium for the 44th Annual Spartan Invitational hosted by Madison Memorial. 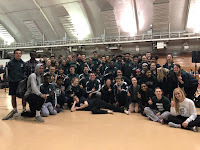 Twelve teams competed for the Spartan Invitational team championship, outstanding track performer, outstanding field event performer, the Stan Richter Mile, Steve Barr 8-lap classic, and 26 total events of track, field, and relay competition. The boys program competed at a high level finishing in 5th place (1 point behind 4th) with a team total of 75 points. This was the best performance of the Spartans squad as they prepare for next week's City Championships. It will be important to continue to perform at a high level across all events against some great competition. The team was led by the 1st place finish of Blake T-J in the pole vault with a vault of 12' 6". Daurice F and Nick M both reached the final of the 110m hurdles finishing 2nd and 7th respectively in times of 15.37 and 16.54. Nick M and Daurice F returned in the 300m hurdles to finish 3rd and 4th respectively in times of 41.87 and 42.17. Some great performances in both hurdle races. The boys 4 x 800 team of Josh P, Jordan B, Tyler M, and Ben A combined for a season best time of 8:12.77 to finish 3rd in the 4 x 800m relay. The team of Courtney M, Alex K, JaVaughn S, and Jon W ran a 1:37.13 in the 4 x 200m relay to finish 3rd place. Jonah W ran a season best 9:50.41 to finish 4th in the 3200m run. Jon W, Courtney M, Tyler M, and Jordan B combined forces in the Sprint Medley Relay (200/200/400/800) to finish 4th with a time of 3:52.32. KeYaunne B, Alex K, JaVaughn S, and Jon W ran a time of 46.22 to take 4th place in the 4 x 100m relay. Micah P jumped 39' 7.75" to take 5th place in the triple jump. Nick M, Robbie E, Ben A, and Josh P worked together to run 3:33.46 in the 4 x 400m relay for 5th place. KeYaunne B made the finals of the 200m dash and finished 6th with a time of 23.46. Many individuals set season best times at this meet and are ready to represent Memorial in the championship season in the coming weeks. In the next days and weeks many athletes 2012 season will come to a close. We have had a great season to this point and look forward to some wonderful end of the season performances. Some athletes will finish the season on Wednesday, others next week at conference, and some with performances at regionals, sectionals or the state meet. The importance is that each athlete performs to the best of their ability and takes positive experiences from this season. As we focus on the future of building Madison Memorial track and field it will take every individual, over many days of improvement, and a great focus on track and field. Let's continue to build from Spartan/Myhrum Invite to City and Conference through the WIAA state series run and into the future.